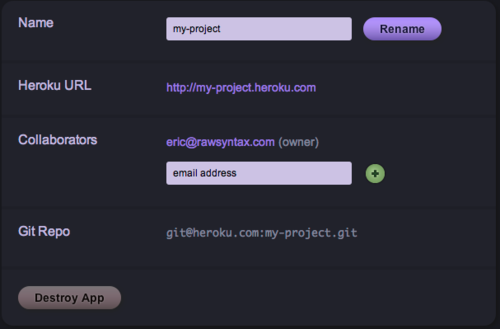 In this post I explain how to host your side project on Heroku for free. There are some limits of course. I'm assuming your side project is written in Ruby (RACK compatible), Node.js, or Clojure. I'm assuming you're using git for version control (heroku uses git push for deploys). I'll also discuss storage limitations (database, web assets, etc). First install the heroku gem. Then create a project with the cedar stack on heroku. 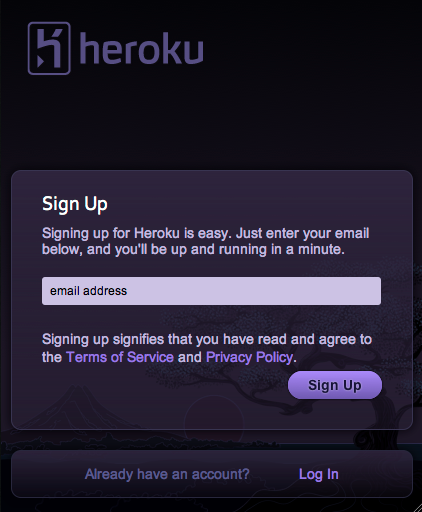 Log in to Heroku and check out your app. You should see something similar to the above. At this point you've created your project on heroku. Awesome, but there's still more to do. Writing objects: 100% (4/4), 459 bytes, done. But most likely you will get a slew of errors. What about database setup and all the other steps that go with production application setup? Here's where Heroku's Addon system comes in. Basically, you're going to replace your database server, frontend load balancing / reverse proxy, and daemon processes / cron jobs with Heroku Addons. This is a subject for another post, but I'll go over what my standard stack is. Lately I've been using Rails 3, Mongoid for models, Haml and Sass for views, and sendgrid for sending emails. Note that your app slug (application files deployed to heroku) is limited to 100mb, but I have yet to run anywhere close to that. My side projects generally run around 10mb. Heroku recommends you use an asset host for any js/css/images. Heroku, with these addons is enough to get any side project off the ground. And there's always the option to scale up with Heroku, or move it to your paid host once it starts to grow.